The Peas in our Pod » happy birthday bridget! Today my niece, Bridget, turns nine. We just spent some time with Bridget as her family was here for our reunion over the 4th of July and we had a lot of fun with her. 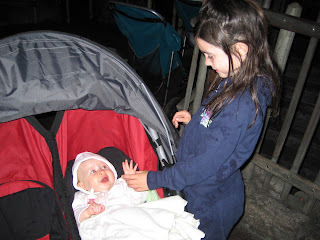 Inez adores her, and it’s really no wonder because Bridget was so kind and patient with her three-year-old cousin. And she certainly put my mind at ease when they were playing together because I knew that Inez was in good hands. 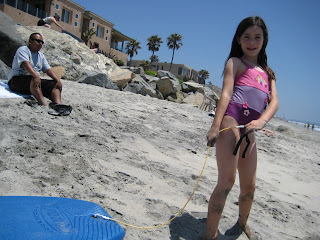 Bridget is a Disneyland loving, little surfer girl (if her Dad has anything to do with it) that lives in San Diego. We love our neice/cousin and hope that she had a wonderful birthday! Here she is with Gwen, after riding Splash Mountain and consequentially getting wet. Happy, Happy Birthday Bridget. It was so great to talk with you. You are SO grown up and such a beautiful person! I love you!